3jc Ltd Warehouse & Workplace Solutions. Unit 113 Condover Industrial Estate. 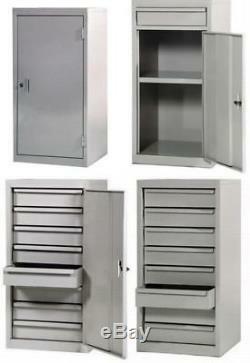 Heavy Duty British Manufactured Tool Storage Cabinets. Constructed from high grade steel with grey powder coated finish. C/w hasp & staple (padlock not included). High quality, strong well manufactured tool cabinets. 1 door with 2 fixed shelves. 1 door with 1 fixed shelf & upper drawer. 2 door with 2 fixed shelves. All measure 915mm tall x 457mm wide x 457mm deep. (except 2 door versions which is 915mm x 915mm x 457mm). Cheques (payable to 3jc Ltd). Any questions will be answered as soon as possible. All measurements are given to the best of our ability. Failure to do this may result in storage charges being applied. Goods for sale can be viewed any time during the stated office hours. Please always ensure you provide your postcode. Larger items are usually delivered by carrier. Please have goods sent to an address where someone is available to sign for goods during office hours. Goods can be collected from our Warehouse near Shrewsbury, Shropshire Monday to Friday 8.30am to 5.30pm. We can also pack your goods for collection by your carrier / transport - We have full loading facilities on site. The item "NEW All Steel Heavy Duty Tool Storage Cabinet / Locker Drawer & Door Choices" is in sale since Wednesday, July 13, 2011. This item is in the category "Business, Office & Industrial\Other Business & Industrial". The seller is "3jcsales" and is located in Shrewsbury.